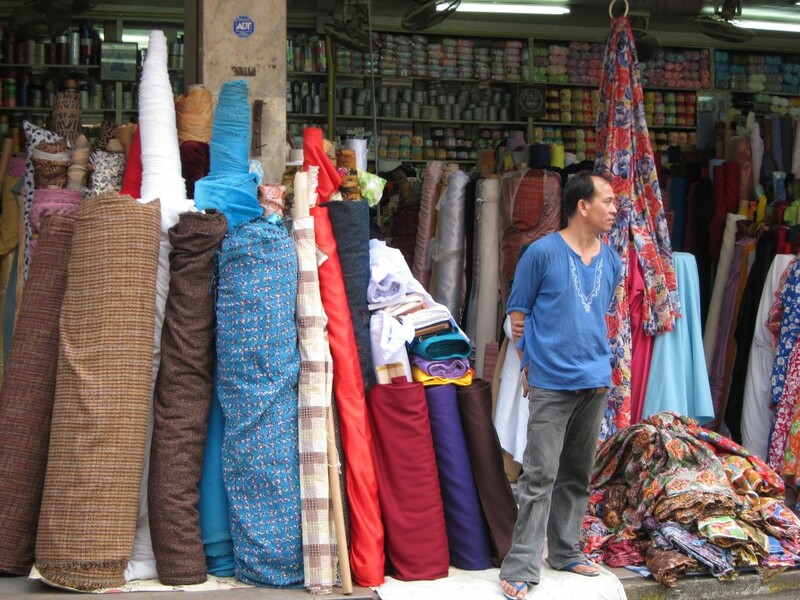 Warorot Market sells inexpensive products as clothing, fashion jewelries and personal care products. It is a must-visit shopping stop for shopping lovers. This is the real thing campers!The night markets are where you go for the tourist thing after dark, and Chiang Mai gate and the old town is the place to go for really incredible street food at night.But this is the place to visit if you want to see where the Thai locals shop.This place is enormous, and the variety of goods on sale is mind-boggling!I came her at least 3 or 4 times, and I didn't do more than scratch the surface.I'm sure that there are designated sections that the locals would know by heart, but for the visitor, it can be a bit confusing to start with.You have clothing sections, dry goods sections, butchers and fish mongers, flowers and bakery goods. You name it! It's here!If you walk around just one section, the 'sameness' of the goods could become boring, but there are always surprises and exotic items that will stir your interest.Just walk around and be taken by surprise.There is a great little cafeteria style place here, which many of the local workers and market vendors use for lunch.The range of fare is very good, the food is excellent and the prices are ridiculously cheap!A bowl of the local noodle specialty will set you back all of 40 baht. (US $1.20) and it is a substantial meal.But everywhere in the markets are food stalls selling the most amazing snacks!Sweet pancakes with a green Thai custard! Or all manner of BBQ meats, ducks, chickens done in different styles, sticky rice, fried bananas, rotis............the list goes on and on!The markets are the best and cheapest places for food during the daytime, and this market, being so huge, has incredible variety!There are a lot of local markets in Chiang Mai, and it warms my heart to see the diversity and the 'sole trader' enterprise, which the Thai people still embrace over and above the homogenized multi-national 'supermarket' culture which has taken it's place in the west to a large degree!Long may markets like Warorot live and thrive!If you are looking for a true local Chiang Mai experience, come here.And not just once! Don't miss this interesting market where you can pick up almost anything. 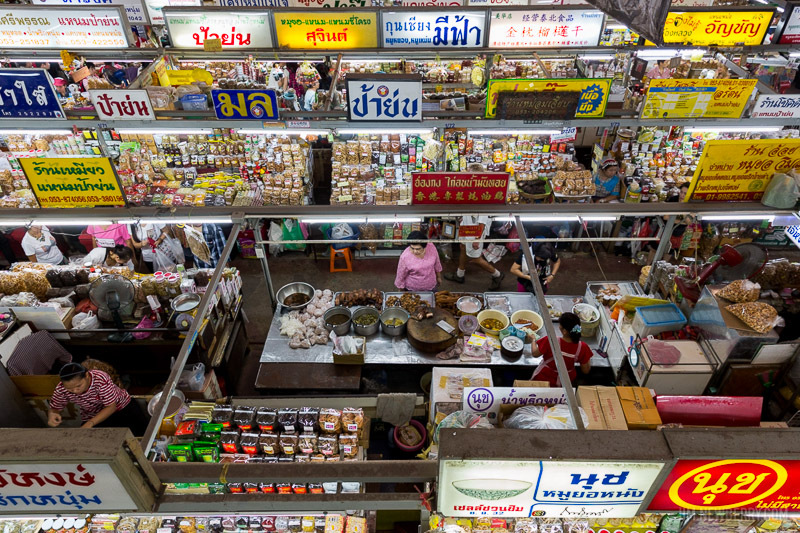 Two sections - The wet market where all the local buy their supplies of meat, vege and spices. Not for the faint hearted at certain sections where the smell can be overwhelming but certainly an eye opener on the daily lives of the locals.Across the road is the other building which houses all the snacks stalls. You can find anything from spices to nuts, fruits, local cooked food/snacks, and the numerous stalls selling similar stuff like preserved fruits, teas, interesting stuff you may want to bring back for your office collegues and friends. Upper floors you will find stalls selling toiletries/cosmetics, clothings and footwear. At a small area on the highest floor and basement, you can grab a cold drink or some local dishes where the food stalls are located. For foodie, you must try the famous Chiangmai Namprik. On the groud floor, look for this stall manned by a grand old dame and her assistants. Look for the stall with the longest queue/crowd and you will see trays of fried pork, preserved pork sausage (naem), chiangmai sausage (sai oua) and the famous Namprik Num (made from green chillies) and Namprik Ong (Tomato based with minced pork, similar to the Chilli concarne). Order some of everything and don't forget some sticky rice to go with it. Won't regret! Spend time in and out of the buildings as small push carts and make shift stalls lined outside selling interesting stuff/food. Walk further away, nearer to the river, you find stalls selling fresh fruits, following by the Thai Jasmine Garlands, followed by fresh cut flowers and supplies.A favourite destination that I never miss whenever I vist Chiangmai. If you are looking for authenticity, especially for where to find traditional northern Thai street food, then go here. The market is a labyrinth, so take your time and don't worry about getting lost. Just make it an adventure. This is the real thing campers! The night markets are where you go for the tourist thing after dark, and Chiang Mai gate and the old town is the place to go for really incredible street food at night. But this is the place to visit if you want to see where the Thai locals shop. This place is enormous, and the variety of goods on sale is mind-boggling! I came her at least 3 or 4 times, and I didn't do more than scratch the surface. I'm sure that there are designated sections that the locals would know by heart, but for the visitor, it can be a bit confusing to start with. You have clothing sections, dry goods sections, butchers and fish mongers, flowers and bakery goods. You name it! It's here! If you walk around just one section, the 'sameness' of the goods could become boring, but there are always surprises and exotic items that will stir your interest. Just walk around and be taken by surprise. There is a great little cafeteria style place here, which many of the local workers and market vendors use for lunch. The range of fare is very good, the food is excellent and the prices are ridiculously cheap! A bowl of the local noodle specialty will set you back all of 40 baht. (US $1.20) and it is a substantial meal. But everywhere in the markets are food stalls selling the most amazing snacks! Sweet pancakes with a green Thai custard! Or all manner of BBQ meats, ducks, chickens done in different styles, sticky rice, fried bananas, rotis............the list goes on and on! The markets are the best and cheapest places for food during the daytime, and this market, being so huge, has incredible variety! 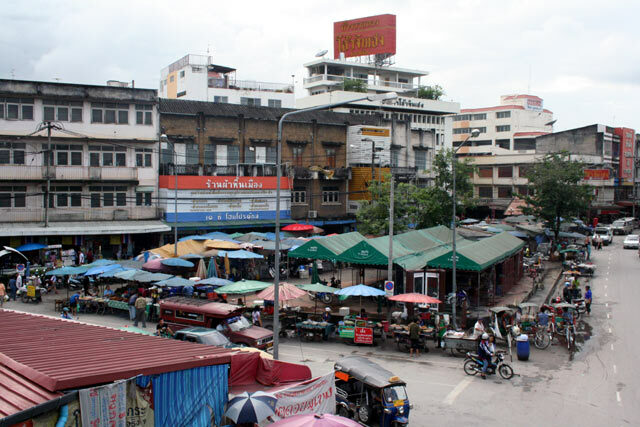 There are a lot of local markets in Chiang Mai, and it warms my heart to see the diversity and the 'sole trader' enterprise, which the Thai people still embrace over and above the homogenized multi-national 'supermarket' culture which has taken it's place in the west to a large degree! Long may markets like Warorot live and thrive! If you are looking for a true local Chiang Mai experience, come here. And not just once!